San Diego, CA - The liturgical day began with Vespers on the eve of St. Thomas Sunday continuing with Matins and the Hierarchical Liturgy the following morning. 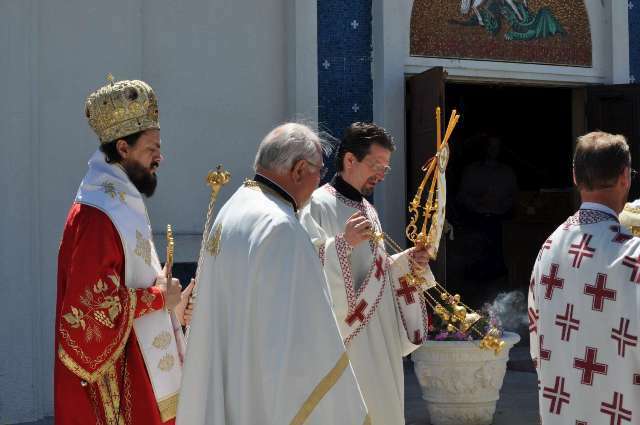 His Grace Bishop Maxim presided at the Liturgy co-served by the local clergy: Fr. Bratso Krsic, the parish priest, Fr. Velimir Petakovic, the priest emeritus, Fr. Milan Vukovic, the priest from the sister parish of St. Petka in San Marcos, followed by the cross-procession or litya around the church with the Gospel readings and the prayer for the faithful, the church, the city and every city and country. When the disciples, all but St. Thomas, had gathered on the new Passover (Pascha), the Lord's Day or Resurrection Day - Vaskrs, Jesus entered the room where they were – "the doors being shut...for fear of the Jews" – stood in the midst of them and showed them His hands and side. Christ then greeted them with that salutation, retained by the Church through the ages, with which the priest greets the faithful at each of the important parts of the Divine Liturgy and other services: "Peace be unto you." This greeting has a profound meaning for believing Christians. It is a reality that the Lord, the Prince of Peace, is present in the midst of human existence. Following the cross-procession His Grace gave his archpastoral blessings and gifts of Christ icons and crosses to all the faithful. He then led everyone to the social hall for the blessing of the Slava kolach. The Kumovi for this year Slava were Nikola and Nada Milicevic. The program started with the junior choir singing "Ljudi likujte, narodi cujte...Hristos Voskrese – radost donese" and other selected songs. Senior Morava – folklore group dancers performed a wedding kolo dance from the Kosovo region. They were all greeted with a great enthusiasm and applause. Fr. Bozidar Draskovic who faithfully served at St. George parish over 20 years was also present but did not serve the Liturgy. Fr. Simeon Corona from St. Gregory of Nyssa, El Cajon, with presbytera Joy and the children and Fr. Isidor Mayoll with his son joined the celebration during the Slava banquet prepared by Snezana Pantovic and Dobrinka Jojic and their families.